The MIDLAND WR300 is an emergency radio that does what it is supposed to do and does it well. It is relatively affordable compared to other items in the line and receives all NOAA and AM/FM channels within the area the user is located. This product is a versatile and convenient alternative for all the people who live in states that are prone to natural disasters. Additionally, it is easy to use and small in size and proves to be a great help when it comes to finding out what the world is up to. The only downfall of buying and using the MIDLAND WR300 is that it is incapable of using different power sources. While other units can get power via sunlight or hand cranking, this one requires a standard AC adapter or 4 AA batteries. It goes without saying that one can forget the batteries at home or in the car in the unlikely event of a hazard. However, if you usually carry a set of batteries with you, this is the right option to get. The vast majority of emergency radios that now exist on the market are able to detect the seven NOAA channels, but do not come with the widely acclaimed S.A.M.E. digital technology. By contrast, the MIDLAND WR300 has this distinct characteristic, with the help of which users now have the freedom to select only the alerts are of concern to them. For instance, if you live in an area prone to flooding but don’t have any risk of getting hit by a tornado, you might want to eliminate tornado alerts even from the beginning. The S.A.M.E. technology makes it possible for the device to broadcast just the warnings that the user actually needs. The MIDLAND WR300 has received many outstanding user reviews on account of its performance. Over 1,000 buyers believe it offers great value for the price and this is the reason they have decided to grant it a 5-star rating. All of the useful features of an emergency radio are packed into a small package, as the device measures just 7 inches by 5.5 inches by 2.2 inches. In fact, the form factor and the small size have been highly spoken of by some consumers. 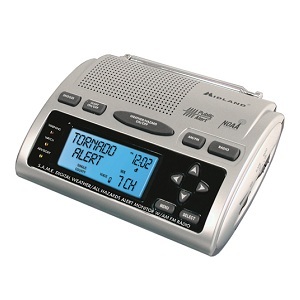 All things considered, when one is struck by a catastrophe, one does not need a big and heavy weather radio. The MIDLAND WR300 might not be the most affordable radio in the world. Some online marketplaces might try to sell it for over eighty dollars, but Amazon customers can significantly benefit from the retailer’s sale discounts. If they choose to keep tabs on the website’s offers, they may have the chance to get it for less than fifty dollars. Considering the number of features of the MIDLAND WR300, that’s not a bad deal at all. 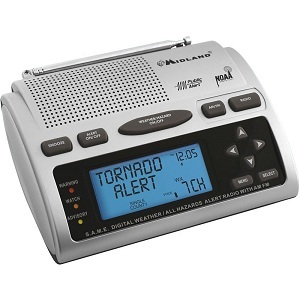 To sum up, the MIDLAND WR300 is an alternative worth considering if you are looking for a relatively inexpensive weather radio that does its job.